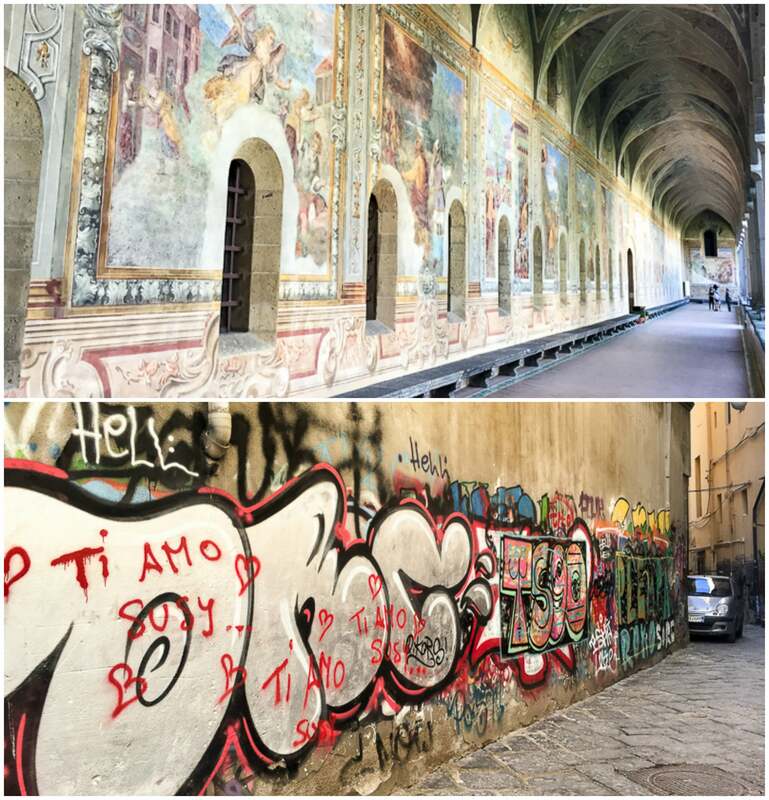 Naples is one of Italy’s largest, oldest, and most colourful cities, and like any Italian city, it’s full to bursting of centuries-old art. 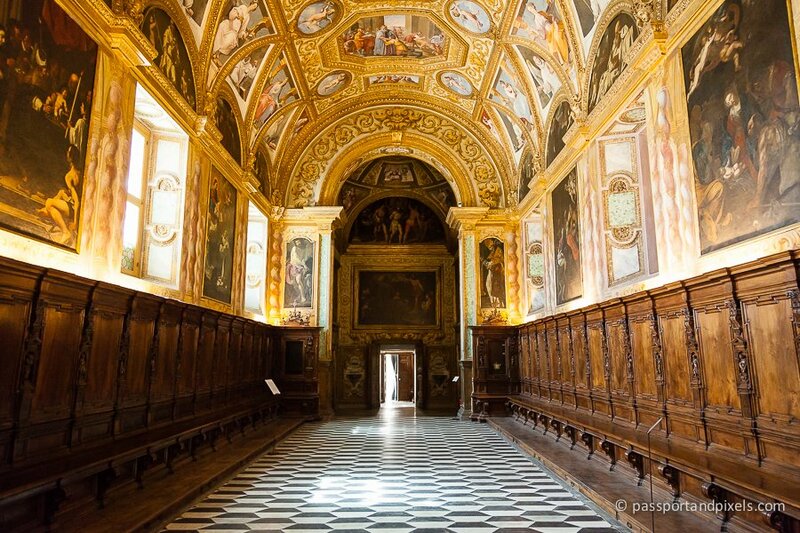 From its UNESCO-heritage-labelled Centro Storico, to the stunning hilltop monastery Certosa di San Martino, the city is generously sprinkled with palaces, churches and grand houses – and each is coated from top to bottom with gorgeous frescoes, murals and mosaics. Yep, when those Baroque and Renaissance architects were putting together their designs, they didn’t hold back. Not for them a nice, inoffensive lick of magnolia Dulux throughout – their walls had to be bling. As bling as possible. 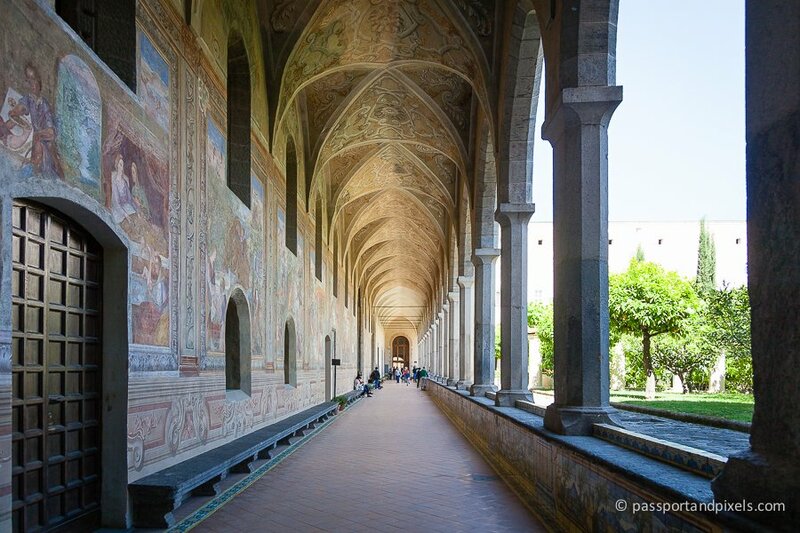 And they didn’t stop at frescoes and murals. 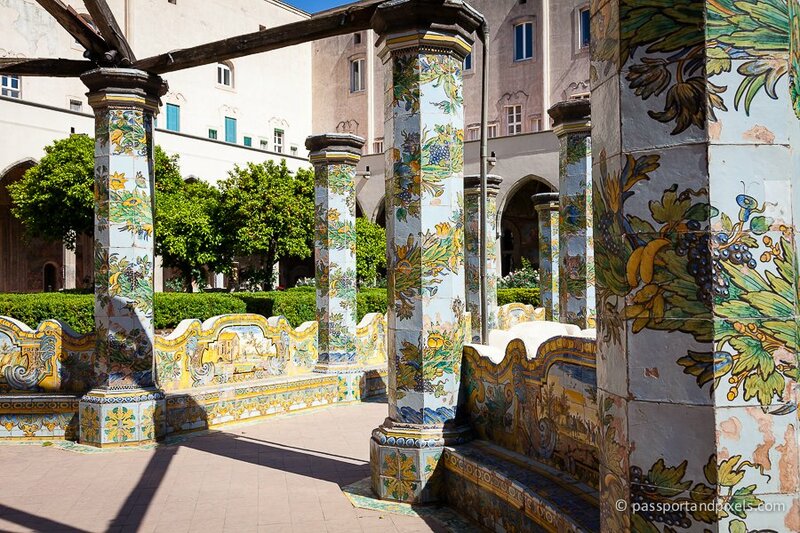 This gorgeous courtyard at Santa Chiara dates back to the 18th century and is filled with hand-painted majolica tiles, on the columns and on the wall and benches that surround the cloister. The paintings weren’t always purely decorative. 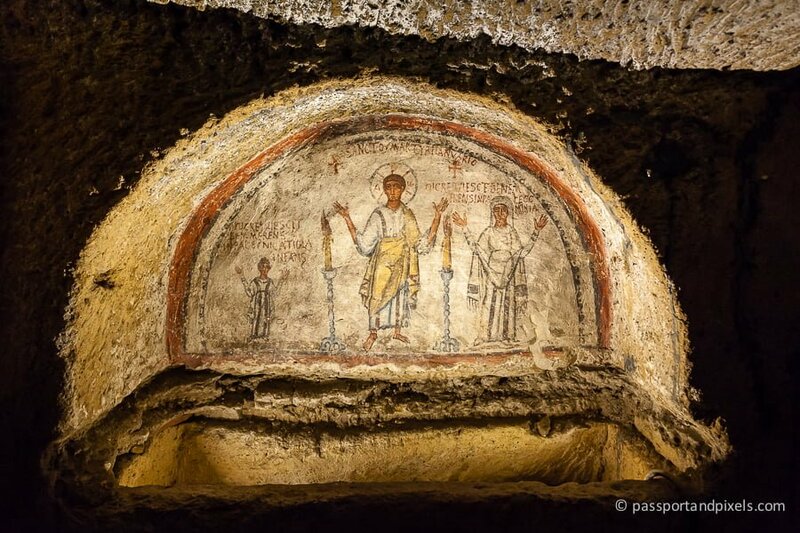 In the Catacombs of San Gennaro you can see frescoes dating back to the 2nd century AD. These wall paintings appear above many of the graves and either depict saints or sometimes key details of the life of the person buried there. This grave contained a father, mother and their daughter, all buried together. 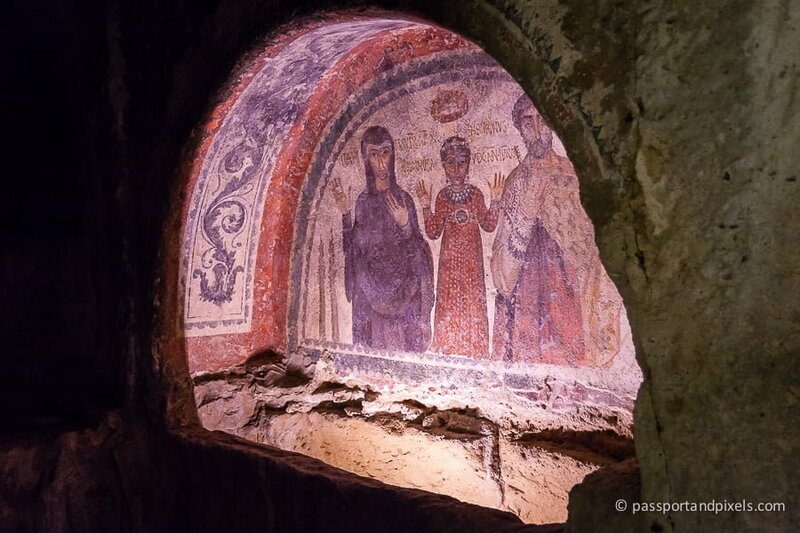 Archaeologists have been able to tell from the layers of paint on the wall that the picture was painted over several times, meaning they didn’t all die at the same time, and each time another family member died the painting was redone with the newest occupant of the grave added in. Clearly times have now changed, and those ancient artists are long gone. 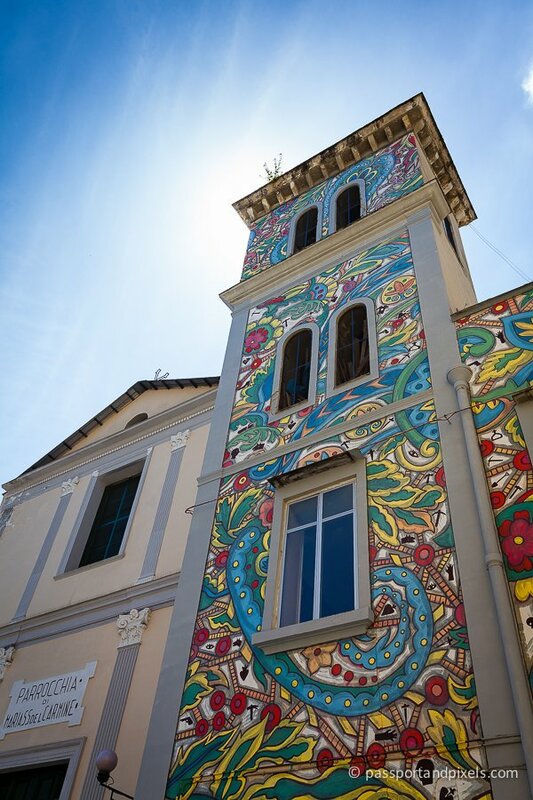 But that doesn’t mean Naples has lost its colourful side. Far from it, in fact. 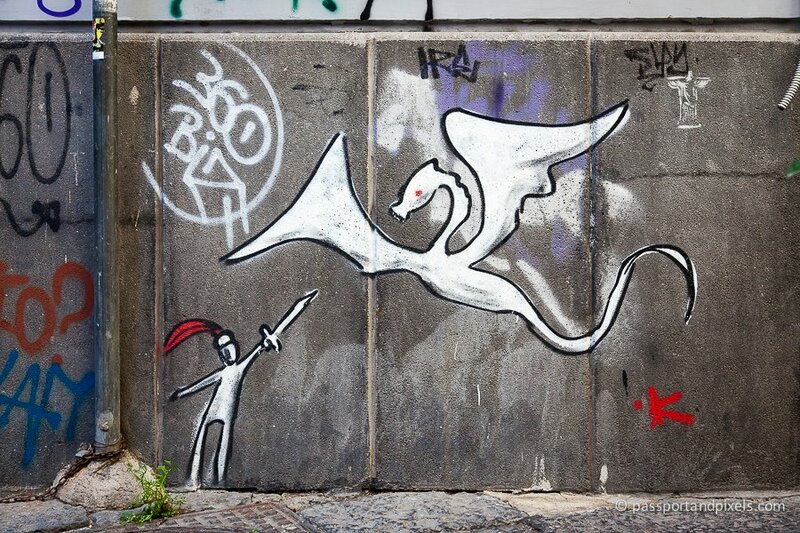 It’s just that the art that appears on the walls of the city today is rather different. 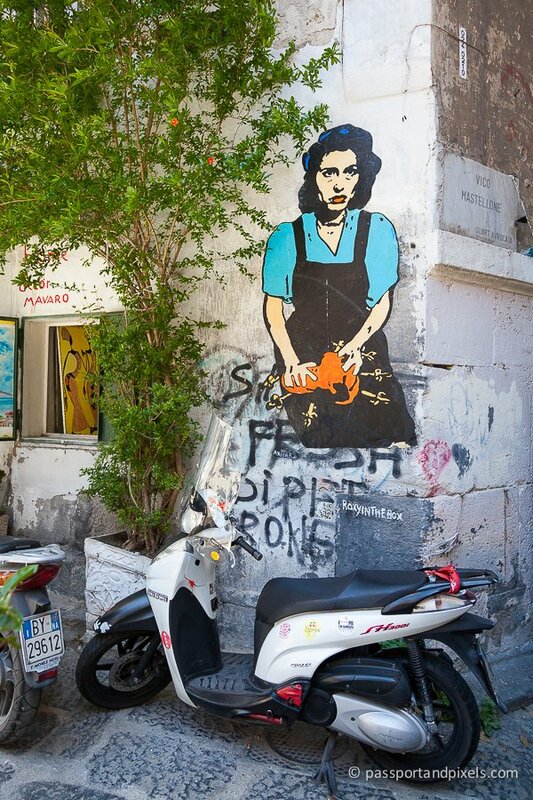 While it may be an ancient city, Naples today is also thoroughly modern, with an active street art scene. This eye catching image appears on an end wall in the district of La Sanità. Even this church has been given a jaunty look. 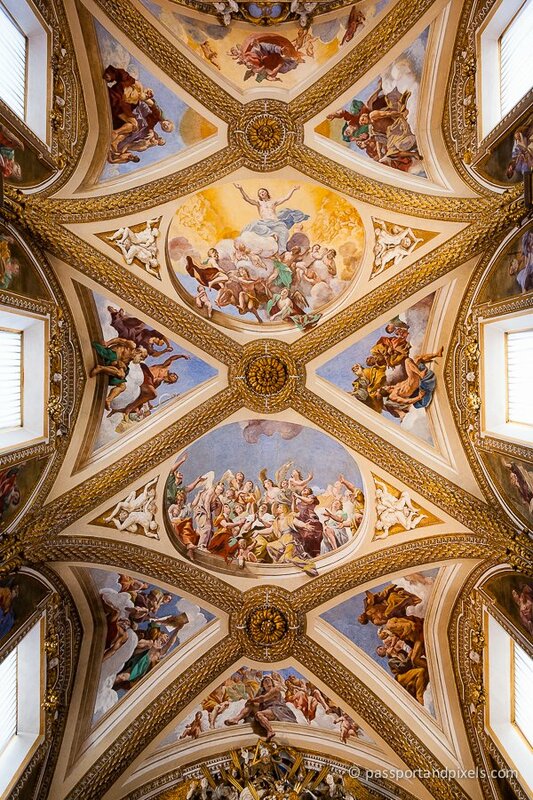 It’s sort of reminiscent of the old style frescoes from hundreds of years ago, but with modern designs and colours. And some of the modern designs still have very traditional themes. 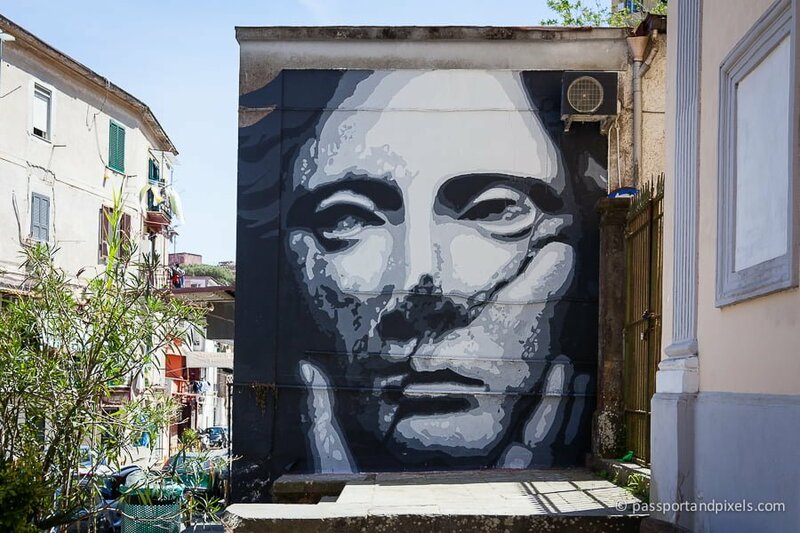 But while some of the designs that appear on the streets of Naples today could definitely be likened to modern versions of the frescoes and murals of the past, the line starts to blur when you get more towards the, shall we say… casual end of the street art spectrum. Is this art? Or vandalism? 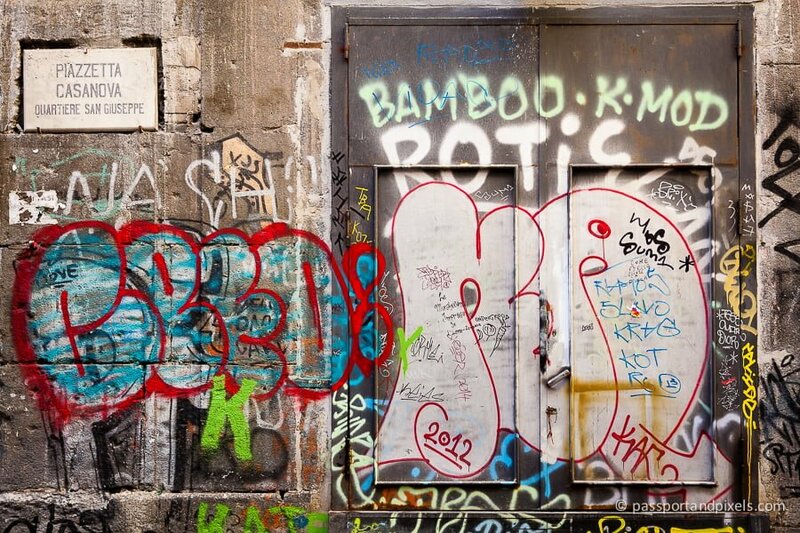 I must say I struggled with the amount of graffiti in Naples. It’s everywhere. On every wall, every door, every shutter. Paint on top of paint on top of paint, with no respect for the ownership or integrity of the wall on which it’s been sprayed. I saw historic churches many hundreds of years old with some teenager’s tag scribbled across the front. 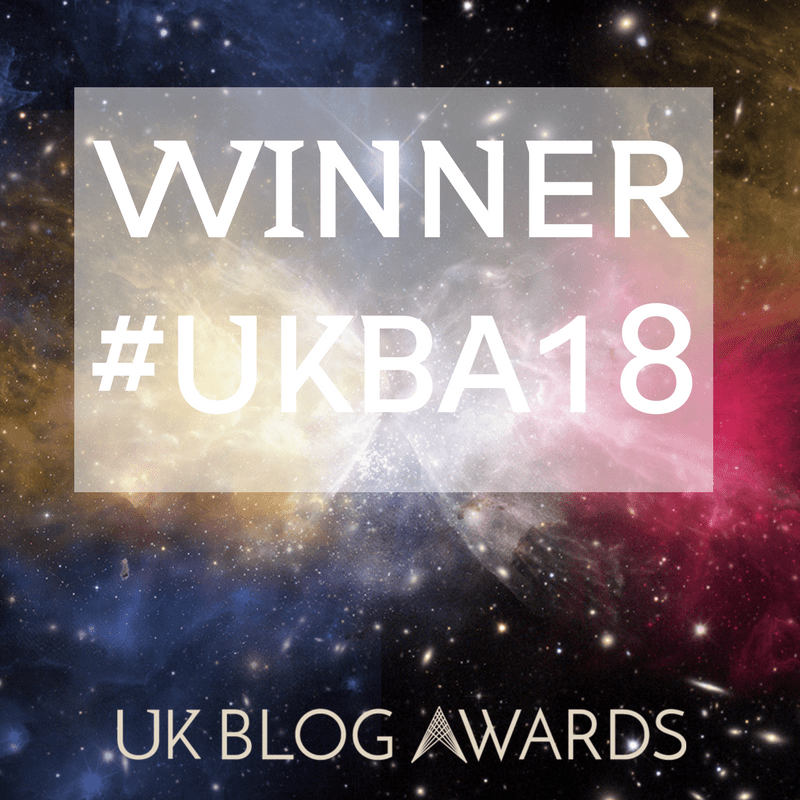 Coming from London, which is mostly clean and paint-free, it was a bit of a shock. The idea of someone spraying their name on one of London’s iconic landmarks… well, it simply wouldn’t happen. 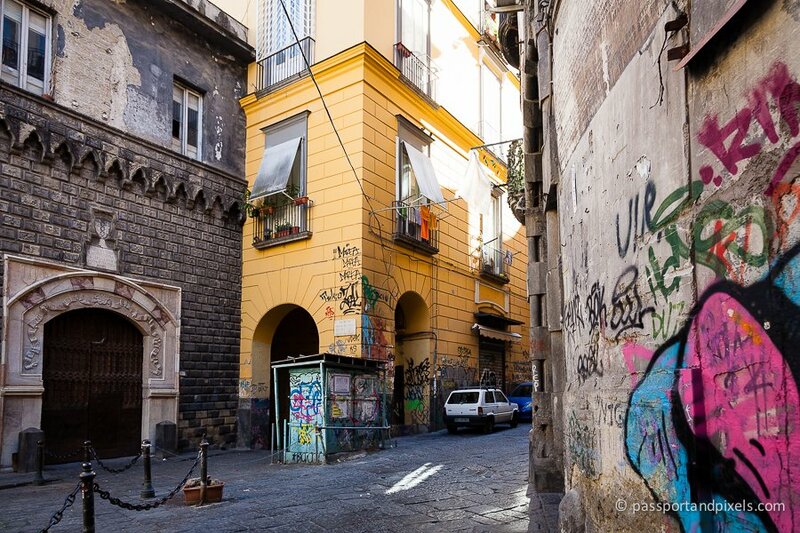 But in Naples, it seems, they can – and do – get away with it. I found it rather sad. 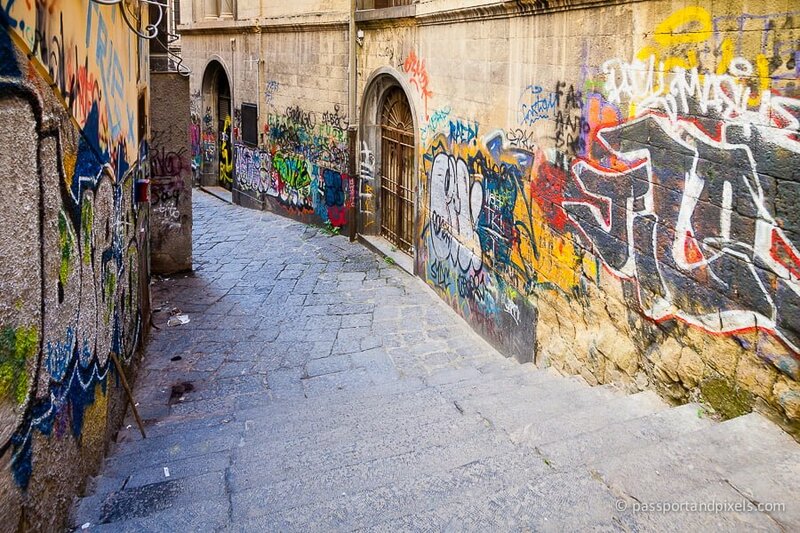 Naples is a beautiful city, and could be even more beautiful if they could only clean it up. But then maybe it’s rather fitting. 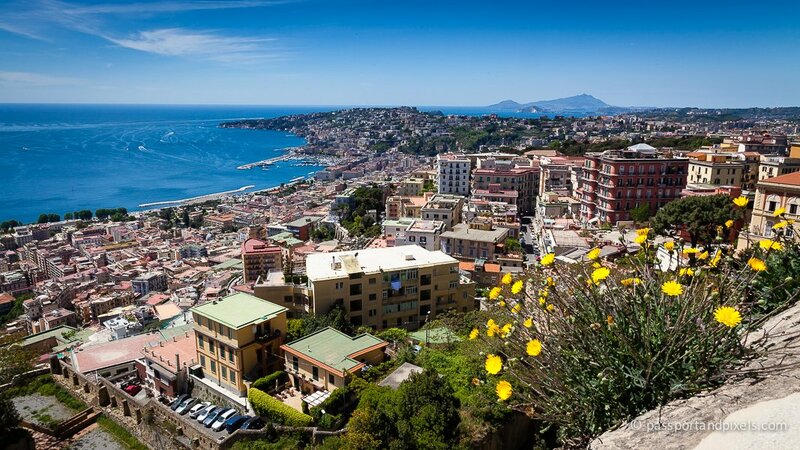 Naples is ancient, and also modern. It’s classical, but also edgy. 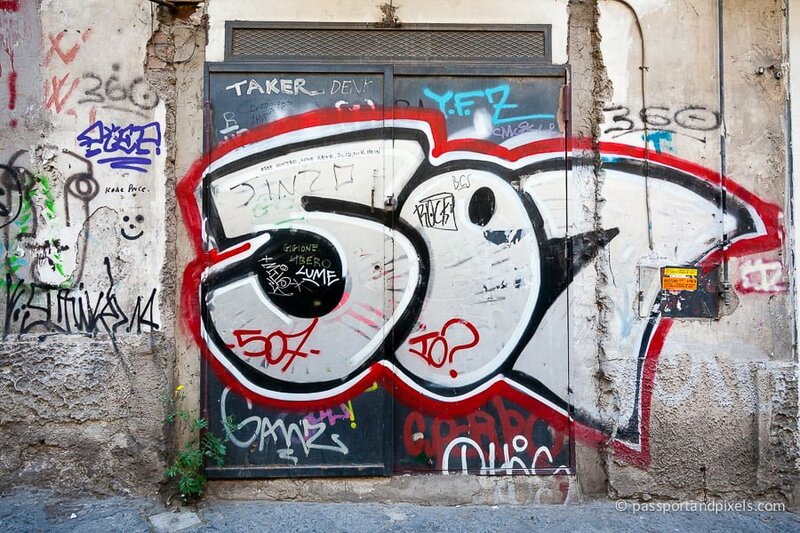 And the street art and graffiti, daubed as it is on top of the historic buildings, perfectly sums up that contrast and contradiction. What do you think? Is one just the modern day equivalent of the other?